What do the divisions on the geologic time scale represent? The geologic time scale is not an arbitrary listing of Earth’s natural history, nor are the divisions merely fanciful. Each boundary between divisions represents a change or an event that delineates it from the other divisions. In most cases, a boundary is drawn to represent a time when a major catastrophe or evolutionary change in animals or plants (including the evolution of specific species) occurred. 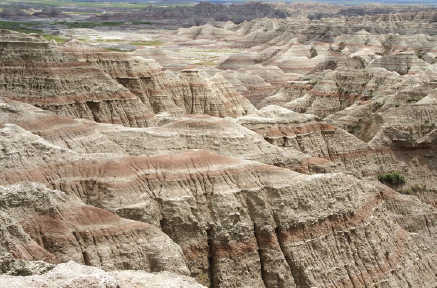 Natural erosion clearly reveals the layers of Earth’s crust, such as seen here in Badlands National Park in South Dakota. Observing these layers is like taking a trip back in time, with each lower level representing a different time period in the planet’s history (iStock).